Mr. Felix Kutsanedzie, the lead author of this book, is a Senior Research Fellow / lecturer and currently the Head of the Accra Polytechnic Research and Innovations Centre. He holds a MSc. degree in Bio-Engineering; BSc. (Agric-Mech); and an Adv. Dip. (Project Management). He is an Associate Editor of Directory Open Access Journals (DOAJ) and a prolific writer with several peer-reviewed publications to his credit. Professor Sylvester Achio is currently the Rector of Accra Polytechnic and a professor at the Department of Science Laboratory Technology of Accra Polytechnic holds MSc. Hons. (Research) Agric (Agronomy), PGC Ed. (Russian Language), PhD. Bio. Sci. (Microbiology). He has authored several technical books, has presented papers at many national and international conferences, workshops, seminars as well as several peer-reviewed journal publications to his credit. Mr. Edmund Ameko is a Senior Lecturer at the Department of Science Laboratory Technology of Accra Polytechnic. He holds a BSc. in Biochemistry and MSc. degrees in Food Science and Technology, and currently the Dean, School of Applied Sciences at Accra Polytechnic. He is a prolific writer with several peer reviewed publications. 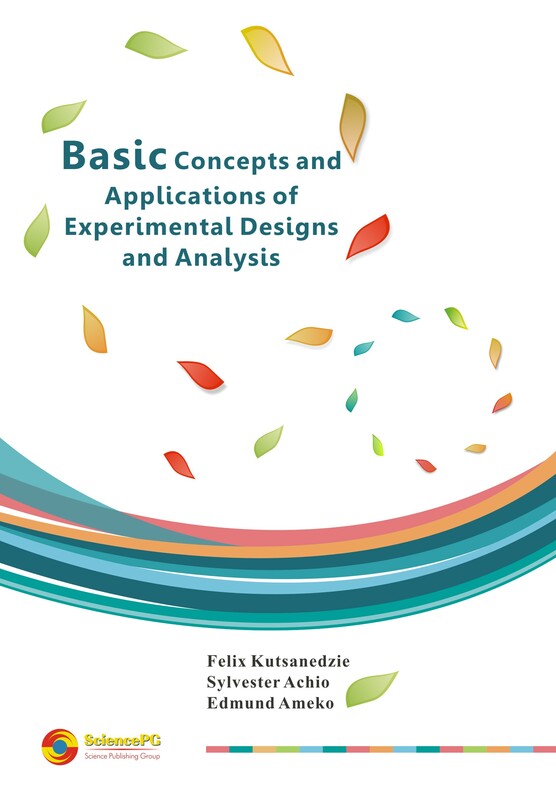 This book covers thoroughly the explanations of the concepts and basic terms in almost all the known experimental designs; the mathematics underlying these; how to select the appropriate designs for a study and a logical sequence of analyzing these designs. For each of these designs, hypothetical examples of experiments have been provided with stepwise approaches towards analyzing them. It treats complex designs in a simplified way to enhance the understanding of its readership. The designs are arranged in a systematic order of least difficulty understanding to more difficult understanding. Researchers, academics and students are always engage in one form of research or the other that requires designing. However be it as it may, most of these individuals are not conversant with in selecting the appropriate experimental designs that should best suit their respective researches or studies.